Hofstra Men’s Club Lacrosse traveled to the U.S. Naval Academy in Annapolis, Maryland to compete in the Elite 8 of the NCLL Playoffs on Saturday, May 6th. Hofstra was shorthanded due to injuries, but fought hard the entire game against Towson. The Pride would go on to lose to the Tigers, who would eventual by crowned the NCLL National Champions, by a score of 10-7. 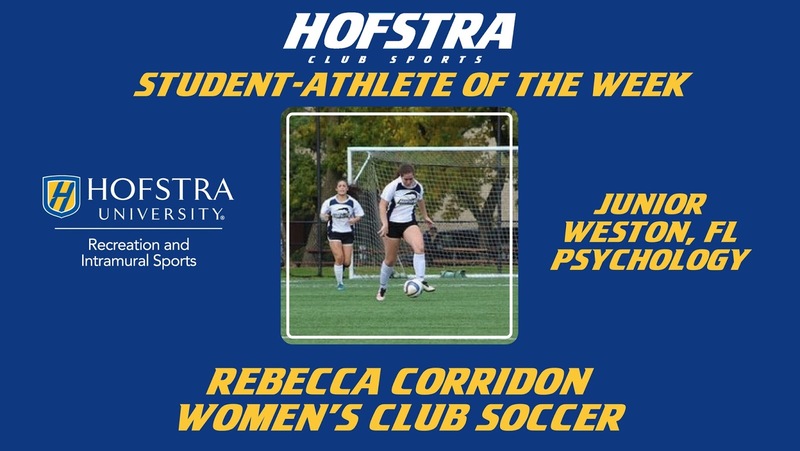 Despite the result, Hofstra capped off one of their most successful seasons in recent history. Hofstra Men's Club Lacrosse competed in the Elite 8 of the NCLL Playoffs at the U.S. Naval Academy in Annapolis, Maryland on Saturday, May 6th. PC: @hofclublax on Instagram. Hofstra Women’s Club Soccer hosted Adelphi University on Sunday, May 7th at the Hofstra Soccer Stadium. Great defense was played by sophomore captain, Sarah Bouzaidi and freshman, Hannah Carmeli. Freshman Marisa Saia and junior, Sarah Cordes displayed amazing speed and commitment throughout the match. Hofstra was able to maintain most of the offensive possession throughout the game. Junior Rebecca Corridon would score the lone goal of the game to give the Pride a 1-0 victory. Hofstra Women's Club Soccer shutout Adelphi University on Senior Day at the Hofstra Soccer Stadium, Hempstead, NY on Sunday, May 7th. PC: Zachary Englis. Hofstra Men’s Club Rugby hosted their alumni on Sunday, May 7th on the Intramural Rugby Field. Nearly 30 former players came back to take the pitch against the current squad. In a close game, the current Hofstra team defeated their alumni, 49-47. After the game, the Alumni awarded Josh Beck with a “Man of the Year” award and scholarship. It was a great day for the current and past members to reconnect around Hofstra Rugby. Hofstra Men’s Club Soccer ventured out to Pace University to take on the Setters on Saturday, May 6th. Hofstra had a fantastic performance and won 6-2. Ziad Al Zayer scored his first hat trick for the club and Cas Fernandes followed up with two goals. Hofstra Club Running hosted the second annual Hofstra Music Fest 5K on Saturday, May 6th. The race ran smoothly with over 30 people completing the race. Eric Monsurez came in first overall with a time of 19:56. Rebecca scored the lone goal in the Pride's 1-0 Senior Day win over Adelphi. 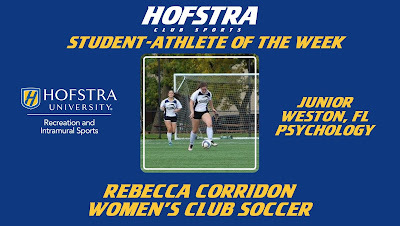 Congratulations to Rebecca! Zachary Englis, Graduate Assistant for Club Sports, contributed to this blog.